JAKARTA, INDONESIA, 3 October 2018 - Aligning with their 8th anniversary (10 October), VeganBurg has announced their most-awaited expansion strategy focusing on franchising footprint in Jakarta - capitalizing on the land of the emerald equator’s love of burgers. VeganBurg will be participating as an exhibitor in this year’s Franchise and License Expo Indonesia, the largest franchise expo in Jakarta, which will run from 5-7 October, 2018 at the Jakarta Convention Center. Since its launch in 2010, VeganBurg has grown to 4 outlets across Singapore, with a further outlet in San Francisco, California. Alongside this expansion, VeganBurg will continue to grow its international footprint with plans for additional franchises across Southeast Asia, North America, and around the world. Indonesia has the largest economy in South East Asia and it’s capital, Jakarta, is hungry for sustainable and plant-based options. In addition, consumer spending is projected to grow by 7.7% annually until 2030. Coupled with a love for great tasting food and all things buzz worthy, VeganBurg and the franchisees see a great potential for business growth as well as climate change awareness in Indonesia. “We made the concept work in Asia - specifically in Singapore, then we put it to the test in San Francisco and the result was exponential! Expanding into the rest of South East Asia was a natural fit based on the region’s love for sustainability and the desire for a more plant-based dining experience. People have been waiting for so long for us to roll out franchising. The wait is finally over!” said Alex Tan, VeganBurg’s CEO. The company optimistically hopes to expand its footprint throughout the South East Asian region as part of its global strategy. SAN FRANCISCO, SEPTEMBER 6th, 2018 – This is not a drill! Bring out your tie-dye bibs and get your peace signs ready. Come September 7th, relive the Summer of Love with VeganBurg’s newest seasonal special, the Rasa Sayang Burg, which literally translates to “Feel The Love” in Malay - a language used predominantly in Singapore and Malaysia. Due to popular demand, VeganBurg San Francisco will be bringing the crazy rich Southeast Asian flavors to the Haight! Inspired by the ever-present Southeast Asian breakfast classic, Nasi Lemak, the Rasa Sayang Burg has a taste that’s enough to seduce with the promise of faraway adventure. It's Eat Pray Love at your fingertips. Layered between the wholemeal buns is a home-seasoned and breaded crisp porcini mushroom patty with a 100% plant-based and cholesterol-free vegan fried egg, and topped with fresh cucumber slices, sweet caramelized onions, creamy vegan aioli, farm-fresh lettuce and a generous dollop of homemade sambal sauce; a red fiery sauce made mainly from chili, rice vinegar and garlic. The Rasa Sayang Burg will be available for a limited time while supplies last for the suggested price of $11.90 ala-carte, and can be enjoyed as meal with Seaweed Fries or Sizzlin’ Broccoli and a chiller at an additional $3.90. Not only that, guests can look forward to enjoying the Rasa Sayang Burg for delivery through their online ordering platform and partnerships with UberEATS, Door Dash, Postmates, Caviar, Eat24 and Grubhub. To order now, visit www.veganburg.com/ordernow. Wherever guests choose to enjoy their Rasa Sayang Burg, they can have a delicious and convenient meal via takeout or delivery where available. Since 2010, VeganBurg has been redefining food pop culture and comfort food with its delectable 100% plant-based menu. The fast-casual restaurant is successfully pushing the limit and breaking the stereotype of how a burger could look, feel and taste like by mixing and matching colourful ingredients, daring flavours and gourmet sauces. Signature fan favorites include the Creamy Shrooms burger, Seaweed Fries, and Sizzlin’ Broccoli. All items at VeganBurg are 100% plant-based and cholestererol free. SINGAPORE, 9 MAY 2018 – VeganBurg is bringing back the kampong spirit of Hari Raya with the launch of a new seasonal special, the Rasa Sayang Burg, on the first day of Ramadan – Tuesday, 15 May 2018. Available for two months only, the Rasa Sayang Burg, which literally translates to “Feel The Love”, captures the joy of the festive season and evokes warm memories of celebration with friends and family. 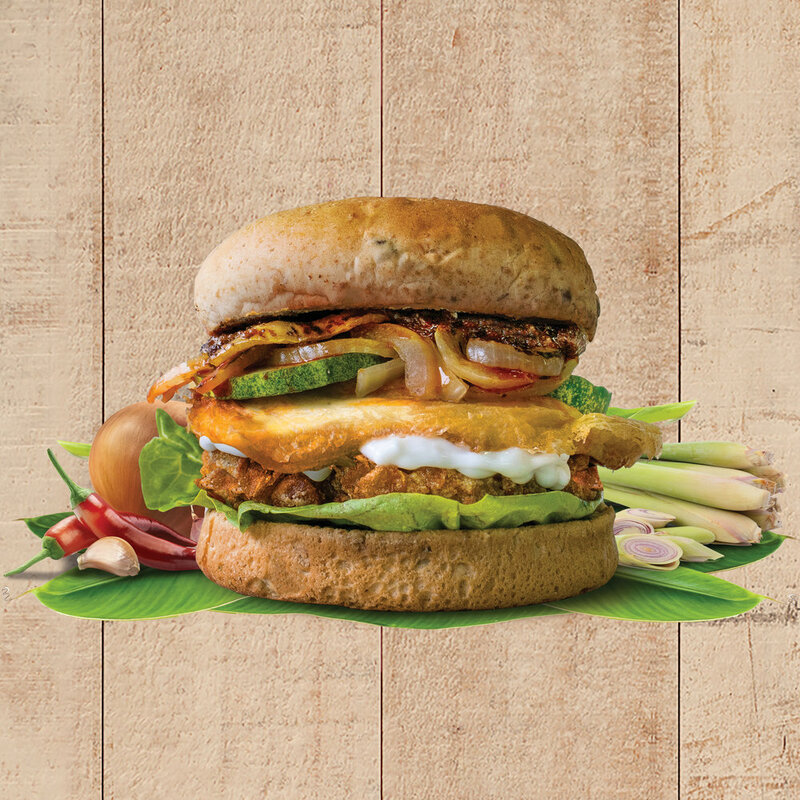 Experience nostalgic elements of classic Southeast Asian flavour combinations with the 100% plant-based burger, made with a home-seasoned and breaded crisp 'chik'n' wheat protein patty, and paired with Singapore's first ever vegan sunny-side up egg on a burger. This is then topped with fresh cucumber slices, a generous dollop of homemade kampong sambal sauce, sweet caramelized onions, creamy vegan aioli, all sitting on a bed of crunchy lettuce and sandwiched between a fresh wholemeal bun. Enjoy a mouth-watering deal and make it a meal with a vegan Rose Bandung drink and Coconut Fries, and then complete the experience with the Chendol Ice Cream, which is flavoured with vibrant green pandan jellies, tropical coconut and luscious gula melaka. The Rasa Sayang Burg is available for $12.90 ala-carte, or top it up at $6.90 for a set meal. Enjoy the Chendol Ice Cream at $5.90 with every Rasa Sayang meal purchase. In addition to its warm and festive offerings in-store, VeganBurg now offers guests even more ways to celebrate the Hari Raya season through its new island-wide delivery and pick up platform, https://veganburg.oddle.me. The Rasa Sayang Burg and Coconut Fries will be sold exclusively through the online portal for a one week run beginning 9 May before it is available for general release in-store on 15 May. VeganBurg is open daily from 11.30AM – 10.00PM and will continue to operate over the holidays, including Hari Raya Puasa. Since 2010, VeganBurg has been redefining food pop culture and comfort food with its delectable 100% plant-based menu. The fast-casual restaurant is successfully pushing the limit and breaking the stereotype of how a burger could look, feel and taste like by mixing and matching colourful ingredients, daring flavours and gourmet sauces. Signature fan favorites include the Creamy Shrooms burger, Seaweed Fries, and Sizzlin’ Broccoli. All items at VeganBurg are 100% plant-based and cholesterol free.